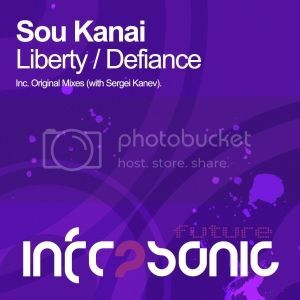 Sou Kanai - Liberty E.P [Infrasonic Future] | OUT NOW! Thread: Sou Kanai - Liberty E.P [Infrasonic Future] | OUT NOW! After scorching the trance scene in 2013 with the likes of ‘If Only’ and ‘Before You Become A Memory’, the rising star that is Sou Kanai is about to drop yet another masterpiece with the double header ‘Liberty E.P’. Getting straight down to business, the E.P opens with ‘Liberty’. A full on trancer with its throbbing kick, raucous bass note and lush, haunting vocal fx. The break is a true hands to the lasers experience and the drop gives you those goose bumps only the world’s best producers can dream of delivering. Taking things in a slightly different directly, yet maintaining that sumptuous Sou Kanai signature, next up is ‘Defiance’ with Sergei Kanev. It’s another dollop of high octane and highly emotive trance with its peak time melody and ripping lead. Sou Kanai is back with a bang and effortlessly delivers two HUGE offerings.